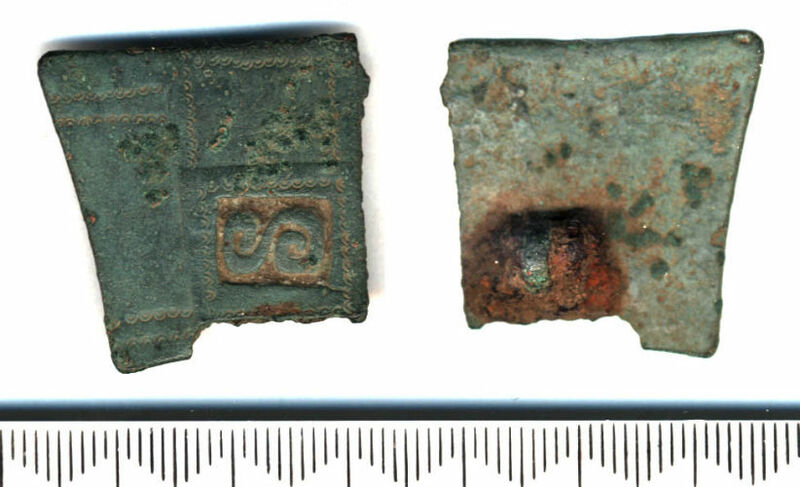 Fragment of headplate from a fairly small example of a great square-headed brooch, neatly made of copper alloy but with no gilding or silvering, and now with a nice dark greyish-green patina. In the centre (to judge from the placing of the single pin bar lug on the reverse) is a sunken rectangular panel with a counter-relief double spiral, shaped like an S on its side. In the sunken field around the S is some white material. There is a raised border around the sunken field, decorated with double-crescent stamps. Below and to the right of this border (as you look at it) are fairly fresh breaks, so that the bow and the right-hand outer panel are missing. Above is a very slightly raised rectangular field with a border of similar stamps around three sides (not the side next to the central field). The rest of the headplate - the outer panel on the left-hand side - is decorated with a double transverse row of similar stamps close to the top edge, and another close to the bottom edge, dividing off the corners. The pin bar lug on the reverse of the S shape is quite small, and has iron corrosion from the spring. 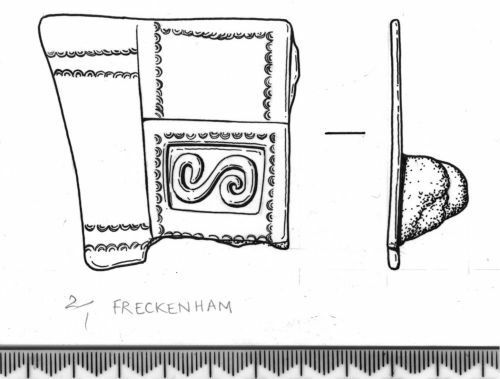 The maximum length of the headplate is 28.5 mm, measured at the extreme left-hand edge; the surviving width is also 28.5 mm, but would originally have been c. 39 mm. The headplate is 1 mm thick. This fragment does not match any of Hines's groups exactly, but in the small size, square central panel and restrained decoration is perhaps closest to group XVII.